Spray 4- to 5-quart slow cooker with cooking spray. Place beef into slow cooker. In small bowl, mix barbecue sauce and beer; pour over beef. Cover; cook on Low heat setting 8 to 10 hours or until beef is tender. Meanwhile, in large bowl, mix yogurt, mayonnaise, sugar, vinegar and salt until smooth. Stir in cabbage and green onions. Cover; refrigerate until ready to serve. About 30 minutes before serving, remove beef from slow cooker; place on cutting board. Shred beef with 2 forks; return to slow cooker to keep warm. Heat oven to 450°F. Make and bake biscuits as directed on pouches, making 8 biscuits per package. To serve, split biscuits in half. 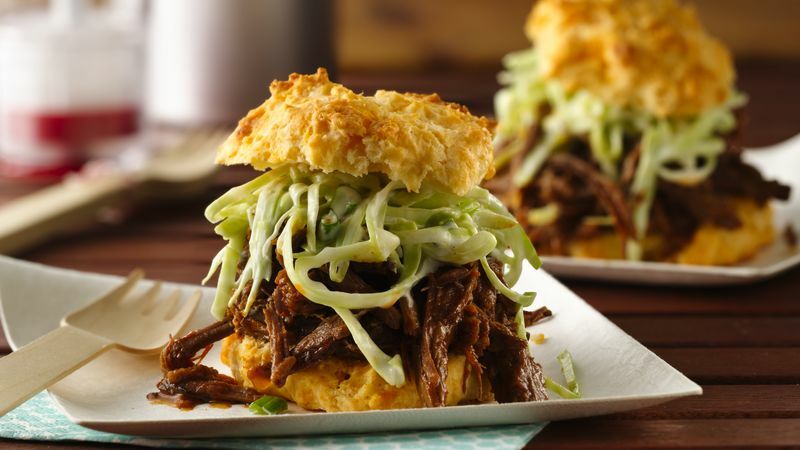 Spoon about 1/2 cup beef mixture over each biscuit; top with about 3 tablespoons coleslaw.